Have you ever seen a sea unicorn? You have now! In the fantastic underwater world of Meamare, there lives a family of unicorns, well hidden in the depths. 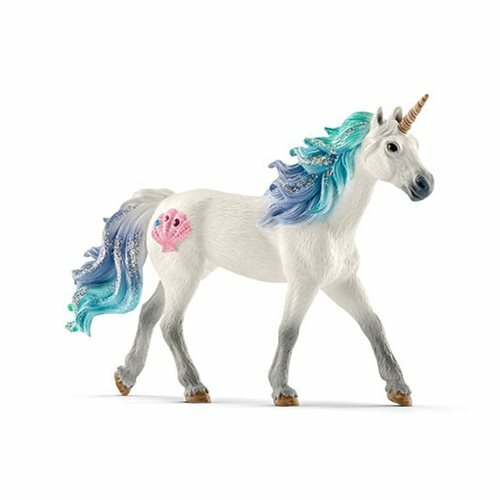 Among them is this beautiful Bayala Sea Unicorn Stallion Collectible Figure. Just look at the wonderful shell pattern that adorns his coat and how his tail and mane glisten in the sunlight! He measures approximately 7 -inches tall x 6-inches long. Collect the foal and mare, too (sold separately)! In the expansive underwater world of Meamare, a unicorn family lives in a shell clearing nestled in the sea forests. Only those who are very lucky and patient get to encounter the unicorn parents and their little one. But once you've seen them, you'll never forget them! A mermaid has managed to become friends with them. She visits them regularly, pets them, and even speaks with them. The three magical creatures are so beautiful and mysterious! Which sea unicorn is your favorite?